Tobias Leingruber at Unlike Us #3 organized by the Institute of Network Cultures, March 22-24, 2013, Trouw, Amsterdam. Tobias Leingruber, a member from the Free Art and Technology (F.A.T.) Lab, discussed the future of (online) identity in relation to Facebook. He started his talk with an anecdote of bouncers at nightclubs checking attendees’ Facebook accounts on their phones as a way of identification, see BBC’s article on “Bouncers ‘checking Facebook on phones’ as identification.” This implies an interesting shift from traditional identity mechanisms, where the ID is provided by the state (the passport or the driving license) to the social network profile as an un-official identification to enter a club. Facebook has become a very prominent identification mechanism online with Facebook Login (previously known as Facebook Connect) which is used by webmasters and game developers to use the Facebook platform as an identity provider. This is often done because Facebook has a real-name policy: “Facebook is a community where people use their real identities. We require everyone to provide their real names, so you always know who you’re connecting with.” (Facebook Help). The consequence of the increasing presence of Facebook as an identity provider is that in some cases websites cannot be accessed, apps cannot be run or blog posts cannot be commented upon, before identifying with and logging into Facebook. 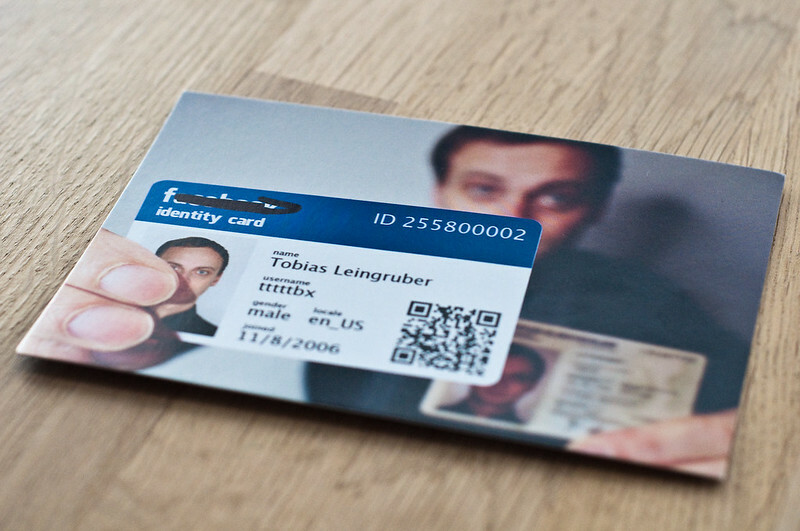 In response to Facebook taking over from the state as an identity provider Tobias Leingruber developed the Social Network ID. 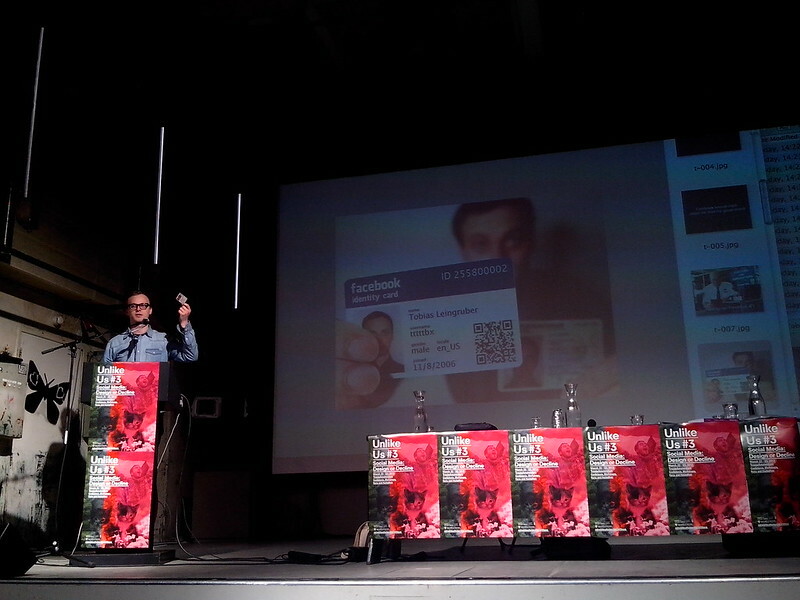 The project was initially called the Facebook Identity card but after a cease-and-desist letter, which according to Paolo Cirio and Alessandro Ludovico from the Face-to-Facebook project functions as a form of recognition or the success measure of a project, and several legal threads by Facebook over the use of its name, Leingruber changed the name to the generic Social Network ID. 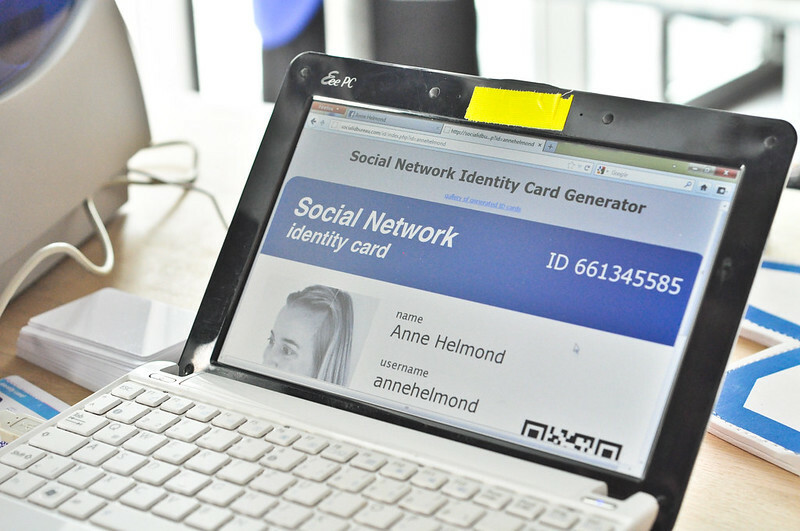 The Social Network ID is created using custom-made software, the Social Network Identity Card Generator, which looks up a user’s Facebook Social Network profile and uses this information to produce an official looking ID-card, using an €800 ID-card printer. The next morning at Unlike Us #3 Tobias Leingruber organized a Social ID Bureau workshop where all conference participants could apply for a Social Network ID card. Unfortunately the printer did not work, but all cards were generated and will be printed and send out to all participants in a few weeks.